Tired jokes and soft edges make this Showtime comedy about the current White House a pointless, unfunny drudge. Setting aside the argument that it’s never too late to humanize a dangerous man (if, in fact, that’s the point the series is trying to make), the caricature of Donald Trump presented in the series is so oafishly relatable he does little to resemble our very real and very dangerous president (aside from a decent impression from voice actor Jeff Bergman). 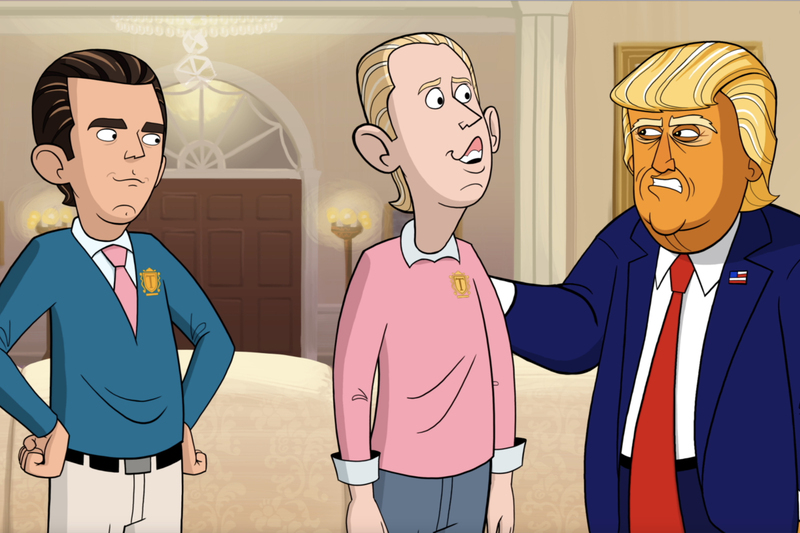 “Our Cartoon President” turns Trump into a dumb sitcom dad, using familiar TV frameworks to drive the story of a witless-yet-working White House that should be batshit insane. Inauthentic and ineffective, the first episode does nothing to justify its existence — including offer any laughs. But in a B-plot that slowly and disconcertingly works its way into prominence, Trump is trying to get Melania the perfect anniversary gift. He asks his V.P. “Michael” Pence for help, and when that backfires, he’s on his own to figure out what to get the “woman who has the man who has everything.” Along the way, he has three sit-down chats with his sons, Eric and Donald Jr., advising them on how to handle his P.R. and receiving key encouragement when he needs it most. This side story sets up a family dynamic that’s all-too-traditional to the half-hour sitcom set-up. In the end [and here’s an obligatory spoiler alert for anyone who’s worried about having the first episode spoiled], Trump “wins” the State of the Union by making a few crazy promises (melting all the #TimesUp pins and taking every U.S. citizen on a Hawaiian vacation), but you only feel the victory when Trump invites Melania to his firetruck podium (a gift from his sons) and makes nice. While capturing the complicated family dynamic that obviously exists in the First Family may have been tricky, reducing it to a put-upon husband trying to please his one-note wife is lazy and unproductive. We’ve seen this before — we get how it works. But we haven’t seen a family like the real-life Trumps, and there are more imaginative ways (let alone funnier) to capture their relationship. Maybe all their issues boil down to Donald disappointing Melania and then making up for it, while their kids try to impress their self-absorbed father, but it makes for boring television, whether you buy into it or not. 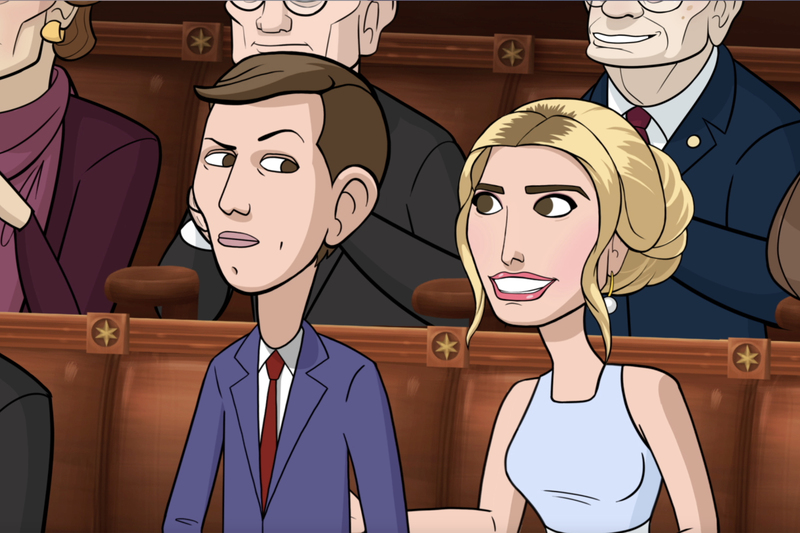 Such a narrow vision of the family is frustrating to watch for many reasons — fake news jokes, jokes about his taxes, and his obsession with New York are dropped in as though they’ve never been mocked before — but most of all because given the genre, this cartoon should be a lot more adventurous. The half-hour animated comedy is only limited by the inventiveness of its creators (Stephen Colbert, Chris Licht, Matt Lapin, Tim Luecke, and R.J. Fried) especially given that it’s airing on premium cable. It could take characters to satirically unnerving extremes and, arguably, it needs to if the series wants to make any sort of point about the current administration that late-night hosts (like Colbert), Twitter, or the general culture haven’t already covered. Perhaps the most important scene in understanding why “Our Cartoon President” doesn’t work comes when Trump sits down to watch a “Greatest Hits” video of the 2016 election. The creators decide to use real footage of Trump mocking John McCain for getting captured and calling Hillary Clinton a nasty woman, cutting back to the cartoon president watching himself on TV; but it’s not him. There’s a clear difference between the flesh-and-blood figure and the animated character watching him: One is distinctly repulsive — he looks like an immoral lunatic who’s losing his mind — but the cartoon Trump is just silly; he’s not a bad guy so much as an empathetic buffoon. “That’s the real Donald Trump,” the cartoon president says, pointing at the real-life Trump’s infamous impression of a disabled reporter. He’s right: That moment feels like the real Trump. The cartoon feels like a lie. And there’s nothing funny about it. The “Our Cartoon President” premiere is streaming now for free. Showtime will debut two episodes on Sunday, February 11 at 8 p.m.